This sauce is exactly like the Middle Eastern Cucumber-Yogurt Sauce (or Salad), minus the Cucumber. It's still very refreshing and goes great with boulanee, and probably with chips. It's also a good spread-substitute for mayo or butter in sandwiches, and if you use non-fat yogurt, it's very healthy. I didn't have original recipe in front of me when I made it, so my modified recipe is just what I did to make it. Mix the yogurt with the garlic and salt. 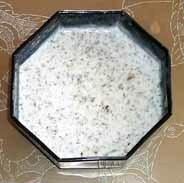 Powder dried mint with your hands and add to yogurt. Mix. Mix together one-half cup of plain yogurt, one-forth teaspoon crushed garlic, one-forth teaspoon salt, and one-half teaspoon dried mint leaves. Serve and enjoy!